Welcome to The Nothing to See Here Hotel! A hotel for magical creatures run by Frankie Banister and his parents. Frankie Banister and his family are preparing to celebrate Granddad Abraham’s 175th birthday – an occasion that’s going to be even more HONKHUMPTIOUS now that Abe’s ghost has showed up! When the unexpected spook reveals a secret UNDERWATER wing of the hotel that’s been hidden away for years, the Banister’s decide there’s only one thing for it … a whopping welcome home bash in the spectacular BRINY BALLROOM. But memories aren’t the only things waiting at the bottom of the ocean. Secrets and sea monsters are lurking in the shadows, and is everything as it seems with Granddad Abraham’s ghost? Or is there something fishy going on? 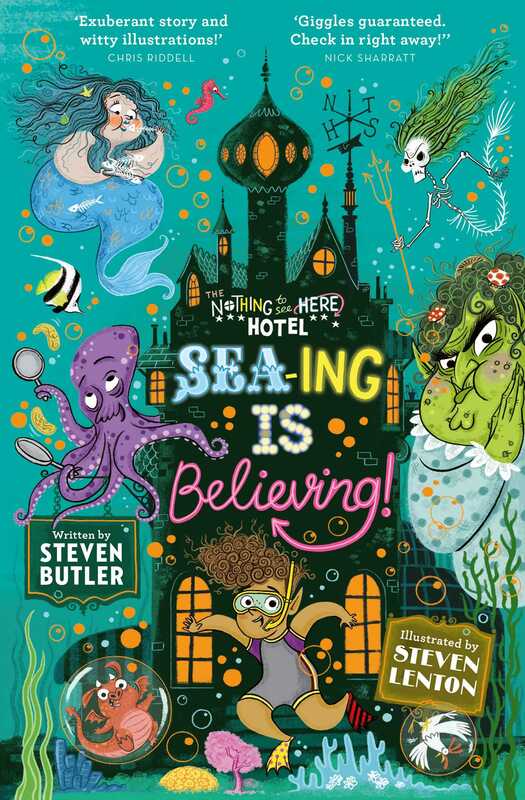 Book your stay at The Nothing To See Here Hotel in this fabulously funny series by bestselling author Steven Butler, with a host of weird and wonderful characters brought to life with Steven Lenton's brilliant illustrations! Steven Lenton hails from Cheshire and now works from his studio in Soho, London creating an array of charming characters for his picture books. Best known for illustrating the bestselling Shifty McGifty series written by Tracey Corderoy, Steven has illustrated many lovely book as well as writing and illustrating his own stories. Book Cover Image (jpg): Sea-ing is Believing!